SafariEgypt has acquired a huge collection of Maps that will be displayed starting Jan 2007. The new collection will include all destinations, cities and tourist attractions referenced in this website. We are now showing maps for the main cities of Egypt. 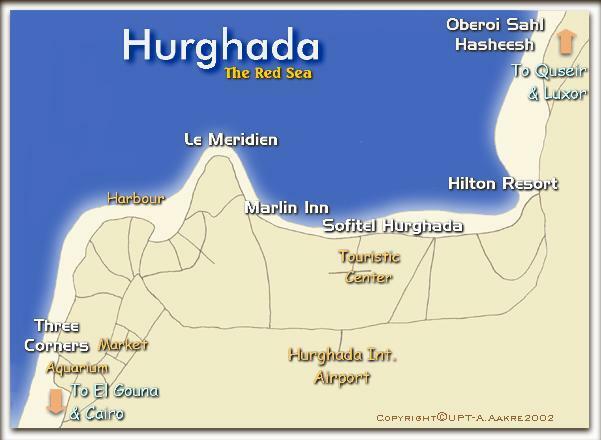 Hurghada ("Gardaga") was just a small fishing city by the Red Sea until it became the first destination developed as an Egyptian major Red Sea resort. Today its the largest Egyptian resort city by the Red Sea. She got a central location by the Egyptian Eastern Desert, with car it's only three and a half hours drive to Luxor with her monuments by the Nile (via Safaga) and about five hours drive to Cairo and the grand pyramids (via Suez). There is an important international airport here, but most traveling with regular flight come here via Cairo. With just a fifteen minutes drive from El Gouna, its also a place frequently visited by those staying in El Gouna's hotels. Many tours goes from Hurghada and inside the mountain area of the Eastern Desert where mines back to Pharaonic times are found. On the way to Cairo is the legendary monasteries of St. Antonius and St. Macarius. St. Antonius (251 - 356 B.C) is considered the founder of monasticism in Christianity, so roots back to his cave north of Hurghada is strong in the Western world. A "key word" here can be the painting "The Temptation of Saint Anthony" by the truly unique artist Jheronimus Bosch (1480-1510). Most famous for those going here, is today still the Red Sea with its coral reefs, colorful fish life, diving - or just relaxation on the beach. A tour on the Red Sea is a must, and there are many islands around you will get to on most tours from Hurghada. The night life is also a own story here - most hotels have own entertainment from live music to disco, and restaurants and bars are found all over the city. All maps, graphics and original descriptions created by SafariEgypt.com, unless otherwise noted and/or directly linked to the source, and use of same for any application whatsoever (with the exception of outline maps) requires written permission. We make no copyright claim on any statistical data on this page, nor on any non-original graphics, and/or pictures not produced by us. Certain statistical data is gathered from the locally published maps (authorized and authenticated by the ministry of Tourism), Google Earth, Google Maps, CIA World Fact book, as well as numerous public domain reference materials. Every effort is made to be as accurate as possible when disseminating information on any Egyptian destination. We are not responsible for unintentional data entry errors or omissions. If you would like to submit an addition, change or correction, or suggest a new link, please forward it to our map department (maps@safariegypt.com) and we will give it our immediate attention.